Lovely, confident and reassuring reading, thank you! My name is Alexander and I have been a professional clairvoyant for 30 years. I first started giving private readings at work and soon everybody was interested. My gift comes from my grandmother who read the tea leaves. 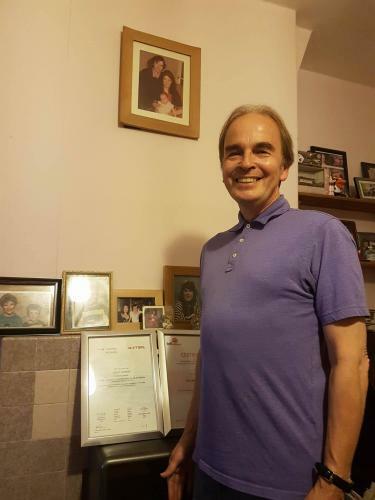 My accuracy was incredible and soon I was featured in Psychic News many times, as well as the Guardian and Gazette, Redbridge Guardian, Yellow Advertiser. I predicted a burglary which happened as I spoke to the client and this was mentioned on LBC Radio. I qualified with The British Astrological Psychic Society founded by Russell Grant who recommended clients to me and today is my Facebook friend who spoke to me recently. My clients include Doctors, teachers Lawyers and Celebrities include Michelle Dotrice actress Roy Dotrice Actor Nadia from TV's Big Brother and many actors from BBC EastEnders which have to remain anonymous. I continue to be recommended to be people all over the world. I have spoken to clients by telephone to the USA, Ghana, Greece, Cyprus, and Spain. I am a sincere Established professional Psychic that cares and continues to help people all over the world. I have recently had a book published, about Cats and Astrology. I love helping people and the feedback and recommendations over the years has grown enormously. The satisfaction of knowing my gift that helped people accurately I have predicted success in exams, marriage, career and successful business. I receive compliments on the telephone all the time because I am sincere and very accurate. Clients tell me my voice has a calm effect and reassures them to be positive and has guided them to a happy future. I am a Gemini I am a qualified Private English Teacher. Gemini is the student and the teacher so I am typical of my sign. Logical quick thinking always learning something new. I love travel and have travelled to the USA, Canada, Tunisia, Egypt, Greece, Italy, Austria, and Switzerland. I love the theatre books, all typical Gemini traits. I trained as an actor with RADA and acting and teaching is so again a real Gemini. Communication is Gemini the third house and again I also trained as a Telephonist. I have been told I look very youthful for my age and like Peter pan never grow old. I was aware of my gift when I was 12 I wrote a story of lady and she became a new friend. I wrote another story and married the character many years later I predicted my father’s passing when I saw Myself and two sisters outside a Bank only weeks later we were talking outside a bank waiting to visit a chapel nearby. I predicted to a client success in flying lessons and now they have a private pilot's license. I can remember meeting people in the street and thinking of them a moment before. I will talk about an actor or actress then they appear on TV. I was tested by other psychics for The British astrological Psychic society and have certificates in clairvoyance and tarot card readings. The many articles by journalists and testimonials from clients show my accuracy and my gift being incredibly strong. The clients who continue to recommend me and telephone me who I have known some over 20 years. When you decide to have a psychic reading you need to believe and have an open mind about the possibilities and that you have a free will and that clairvoyance can guide you and help you to feel strong positive and can be life changing. The comfort and reassurance it gives will be valuable and will help you through the difficult times in your life. I've waited months for a reading, and it was well worth the wait. Some amazing validations, some amazing predictions - a couple that have come in almost immediately. Gave me the name of my nephew - an unusual name - and that there was a celebration around for him. He's 18 in September, but he came unexpectedly to the UK three weeks after the reading, and we had a spontaneous 18th birthday for him. Extraordinary man. Wow!! Best reading I have ever had in my life. It was like he could see in my soul.... Brilliant!!! Alexander is truly gifted. I have had many readings and he clearly saw the problem, situation and described the people in question accurately. He has the wow factor, left me speechless, and he is very fair about not keeping you on the call longer than needed. Great guy!